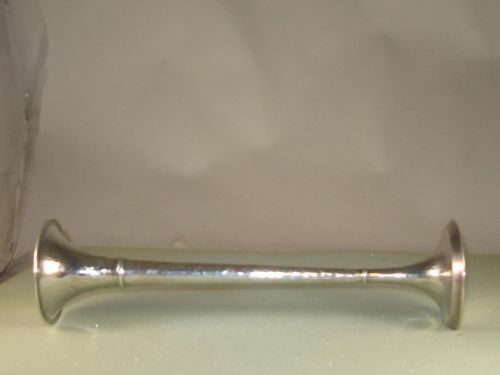 Large sailing ship motif on handle. Diameter 2-1/2". Length 3-3/4". Height 1". Weight 2.6 troy ounces. No monogram. Overall and mark condition are excellent. 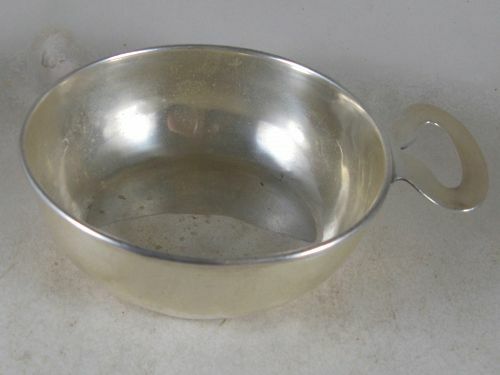 Bowl and underplate divided into five segments. Diameter of bowl 5-1/8"; of plate 7-1/4" Height 2-7/8". 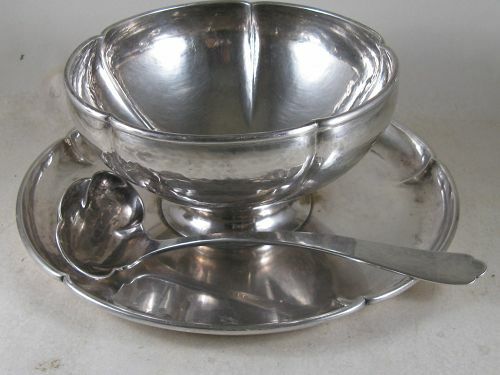 Weight of bowl, plate & ladle is 16-1/2 troy ounces. The monogram on the side of the bowl is an Old English FSM (surname S). 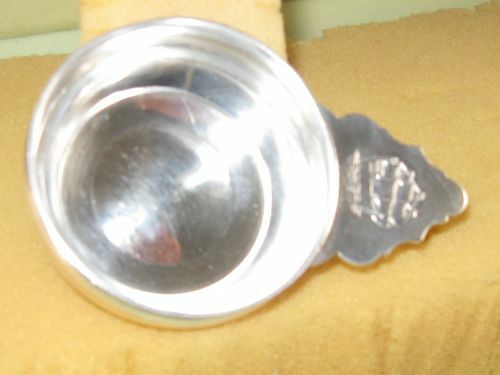 The inscription on the back of the handle of the ladle is AWS/Christmas 1937. Overall and mark condition are excellent. 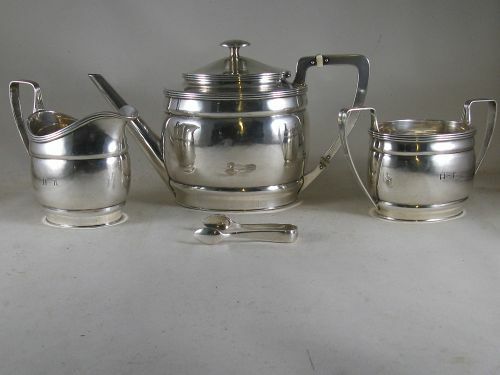 950 silver (i.e. 95% silver vs. 92.5% for sterling). Fun because they rock. Outflaring at top. Height 2-1/4". Mouth diameter 2-1/4". Weight 2,4 troy ounces each. The monogram on the side is a block JFC JR. Overall and mark condition are excellent. 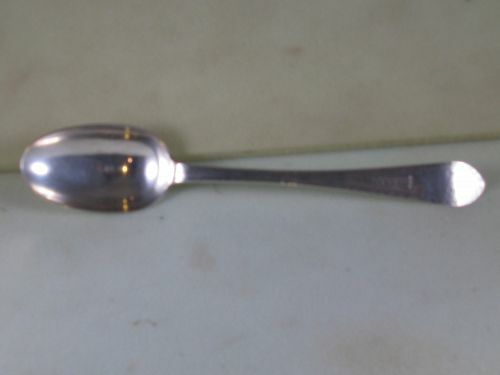 Small cup marked ENSKO, NEW YORK,20th C.
Silver handle, 5-lug hinge. Height 2-1/2". Mouth diameter 2-1/2". Base diameter 1-3/4". Weight 1-3/4 troy ounces. The monogram is a block S/HR on the front. Overall and mark condition are excellent. Marked EHB in triangle/STERLING/23/HAND WROUGHT. length over handle 5-3/4". Diameter 4-1/2". Height 1-5/8". Weight 3.7 troy ounces. No monogram. Overall and mark condition are excellent. 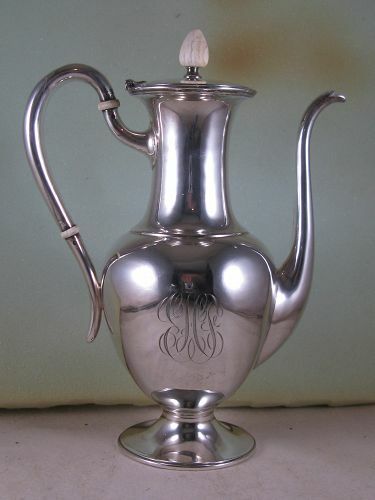 Silver single scroll handle, ivory finial and insulators. 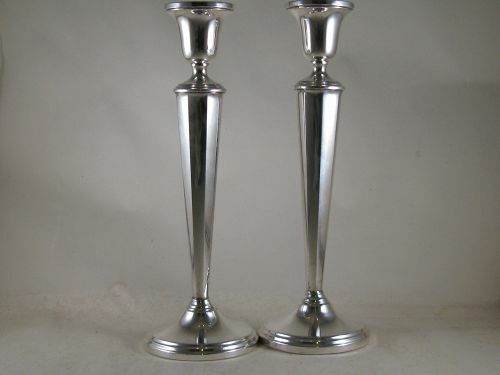 Height 8-1/2". 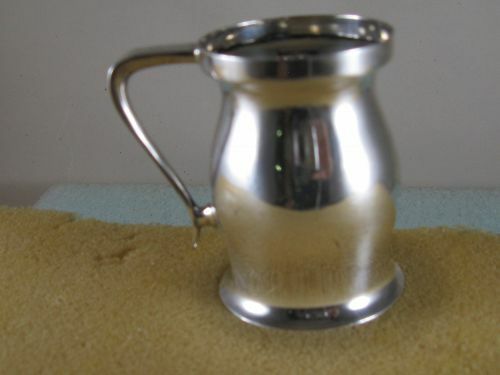 mouth diameter 1-3/4", base diameter 3", capacity 1-1/4 pints, weight (all in)15.3 troy ounces. The monogram on one side is a script JCS (too fancy to be sure). Journeyman Hartwell. Overall and mark condition are excellent. Length over handle 6-1/2". Width 5". Height to handle 2-1/8". Height to front of bowl 1-1/4". Weight 4- troy ounces. No monogram. Overall and mark condition are excellent. Sailing ship on handle. Diameter 2-1/2". Length 3-3/4". Height 1". Weight 2.6 troy ounces. No monogram. Overall and mark condition are excellent. Downturned handle, oval end, bright cut, shell on heel, drop, tipt on back. Length 8-5/8". Weight 1.95 troy ounces. The monogram is a block E+P (could be erased). Mark and overall condition are excellent (very slight tip wear). By journeyman U. Edge and top divided into 7 segments. Diameter 7". Base diameter 3". Height 2-1/2". Weight 10-3/4 troy ounces. No monogram. Overall and mark condition are excellent. Marked incuse SHREVE&CO/SAN FRANCISCO/ STERLING. Beading around edge of plates. Diameter 5-1/4". Weight 2-1/4 troy ounces each. 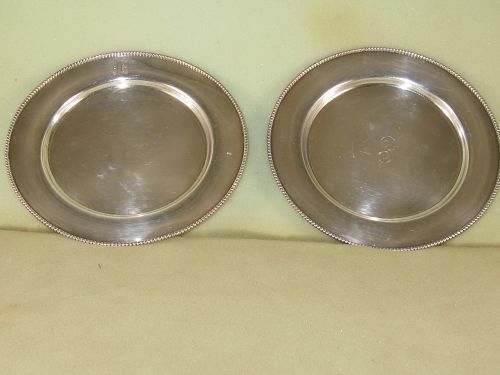 One plate has a script monogram F in the center; the other has an Old English F on the rim. Overall and mark condition are excellent. Bud vase by Friedell,Pasadena,,first half 20th C.
Hammered finish visible. Base filled for stability. Height 11-3/8". Weight (total) 6-1/3 troy ounces. No monogram. Overall and mark condition are excellent. 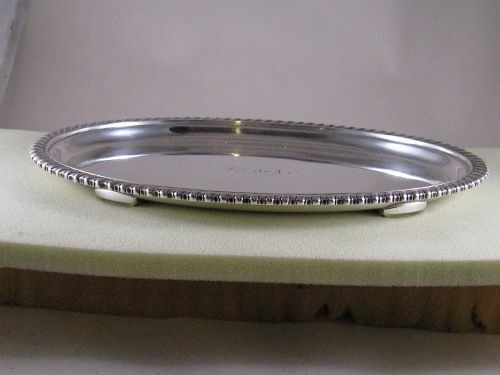 Elliptical tray by gebelein,1st quarter 20th C.
On four feet, 3/8" gadrooning around the edge. 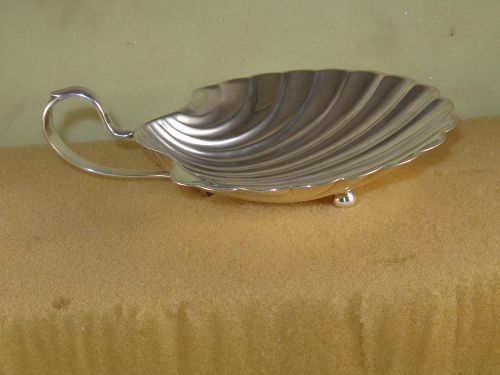 Length 10", width 7-1/2", weight 17-1/2 troy ounces. Block monogram on top surface of tray, C. de L. Overall and mark condition are excellent. 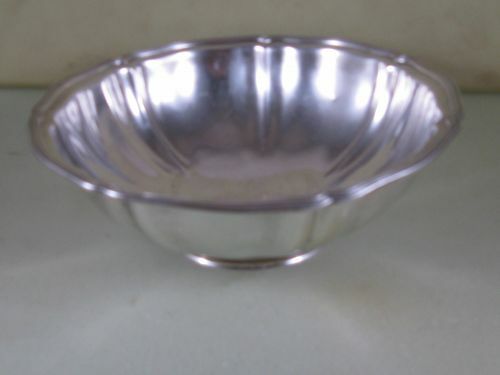 Revere-style bowl, hand made. Diameter 11". Heiht 5-1/2". Weight 43-1/2 troy ounces. On one side is the applied Spee Club insignia of a bear. 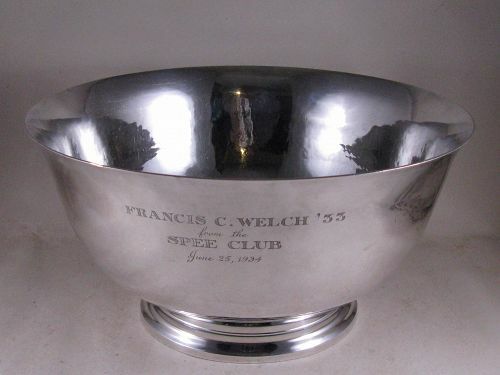 On the other side is the inscription FRANCIS C. WELCH '33/from the/SPEE CLUB/June 25, 1934.Overall and mark condition are excellent. Single scroll handle, applied ring base, reinforcing wire outside of rim. 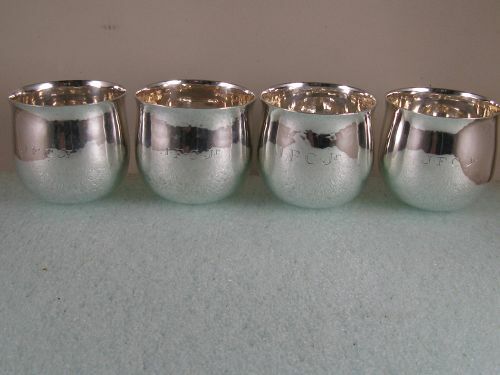 Height 8-3/4", maximum horizontal dimension 8", capacity three pints, weight 24-1/3 troy ounces. 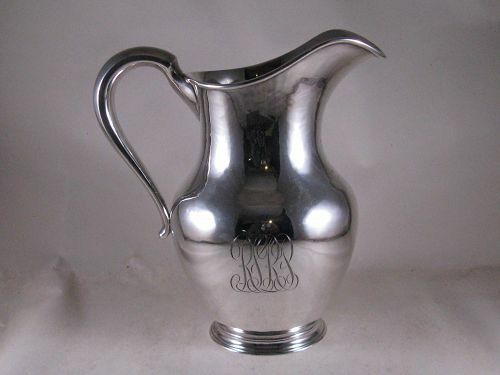 The monogram is an ornate script RSRP(?) on one side. Overall and mark condition are excellent.